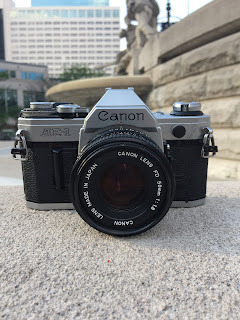 I picked up the all manual beauty, a Canon AE-1 from a camera club swap meet for free a couple of months ago. Yes, let me repeat. FREE. The 50mm lens alone is worth a few bucks so I snapped it up. I loaded it with a battery and it works perfecto. 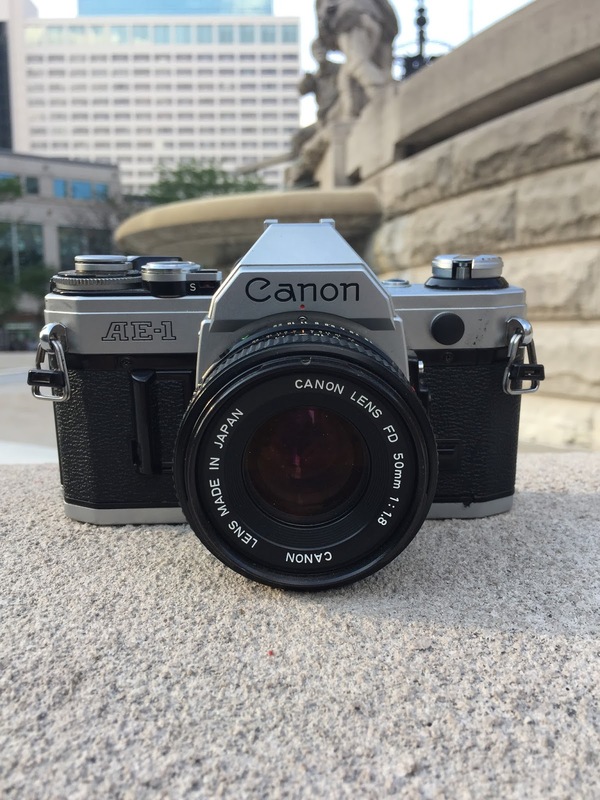 I've been shooting film point & shoots and medium format film cameras lately so I hadn't given this guy a try. I did this past weekend and tonight. During one of my fashion shoots in the studio this weekend I decided I would also take several shots of each clothing look with film. So I loaded a roll of FujiFilm Superia 1600 into this camera and took about 24 shots. I wanted the higher ASA because I didn't want to use studio strobes, just light in the studio and outside. The camera worked well. The light meter seemed very responsive. Because I had about 12 shots left I decided to take it downtown and do some street photography while the sun was still bright. I simply cranked the speed to 500 to 1000, the lens aperture to 16-22 and shot away. Now for the tricky part, I'm going to process the film myself. Fingers crossed.